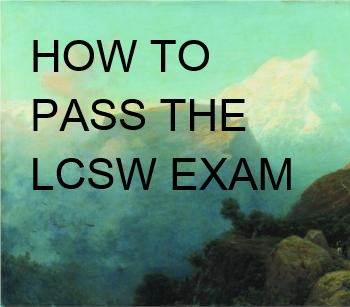 How do you pass the LCSW exam? Concrete reply: correctly mark enough answers to satisfy your state licensing board. (Remember "concrete"? It's on the MSE.) Okay, but how do you go about doing that? 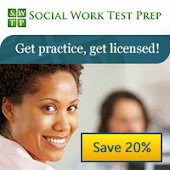 How do you prepare to pass the social work licensing exam? There are countless paths to the goal. Some people prepare for a couple of days and trust their nurture-born test-taking skills. That can work out just fine. Others set a test date a couple of years in advance (yes, years!) and study ever last scrap of social work knowledge over the 700-plus days that follow. That can work out just fine too (if you don't mind all the hours lost to studying). For most, the middle road is the one chosen. It's Goldilocks' just-right porridge (if exam prep was breakfast mush). Somewhere between the hyper-confident two-day prep and the anxious, overlong mega-prep lies that middle path. Only you (and your initial practice test scores) know how much prep you need. What kind of test taker are you? How long has it been since you were in school? Does your work experience help with getting exam questions answered right? How much time do you have in an average week to set aside for studying? Have you already tried the exam and didn't reach that golden "PASS"? You get to make your own self-assessment. You get to set your own schedule. You get to choose how to spend your time. There's a lot of material that could show up on the exam. Try searching ASWB.org for the current clinical content outline--the current list of KSAs (knowledge, skills, and abilities being tested for on the licensing exam)). Yes, 170 is an awful lot of questions, but it's not enough to cover everything listed there. What's most likely to show up you can probably guess. Meat and potatoes social work. Basic assessment, basic diagnoses, basic interventions. Close call vignettes that test your familiarity with the principles contained in the NASW Code of Ethics. Duty to warn, scope of practice--that sort of thing. What the test basically aims to discern: Are you a competent social worker? Can you be trusted with client care? Will you do you best to respect and help your clients? For some of the exam, you need specific information (e.g., DSM criteria). But for a lot of the exam, you can go with your gut. You're a social worker. You know how to do the job. Now just apply it to the test. You'll be licensed soon! I just wanted to drop a note and thank you for your posts. i have been working towards taking my LCSW exam and it has been a really hard road for me. Managing being a mom and wanting the career of my dreams hasnt been easy to balance. and the shadow of the exam has been daunting. I have found great comfort from your suggestions. between you and the study helps i found from https://www.socialworkhelper.com/2015/06/01/need-help-passing-social-work-licensing-exam/ i really think i can do this. so thank you so much.